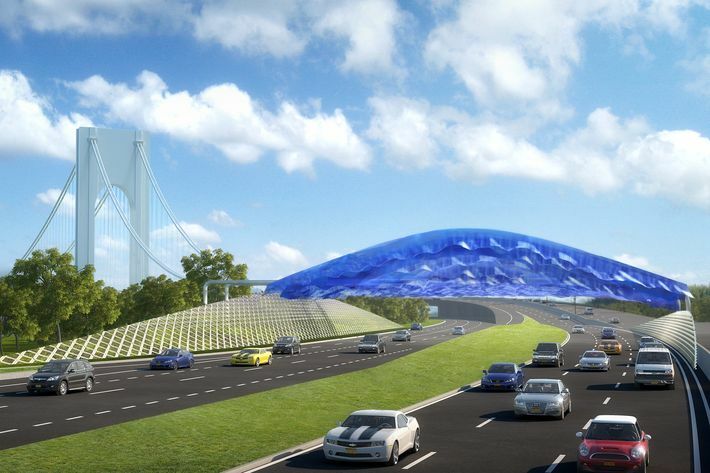 The biggest element of Cuomo’s new proposal, unveiled Wednesday, will eliminate all tollbooths at the MTA’s seven bridges and two tunnels, and replace them with automatic tolling. Drivers will continue to use EZPass, and if they don’t have one, their license plate will be recorded and they’ll get a bill mailed to them. The “open road tolling” is intended to help reduce congestion and accidents at these entrances, as no one will need to stop or be the guy who crosses three lanes of traffic. 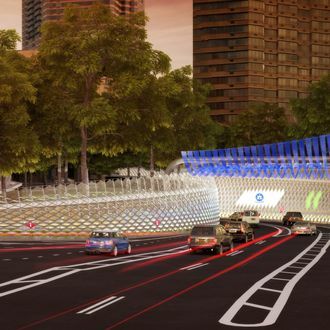 These automatic tolls will also be refashioned as public art. These designs will be made of chain-mail fabric and sway in the wind to create a “wave-like” effect, according to the governor’s office. This proposal also calls for enhanced security at the city’s bridges and tunnels, and for upgrading the infrastructure with earthquake and flood protections. The plan will cost a total of $500 million from the MTA’s capital budget, and the New York Times reports that tollbooth workers will not lose their jobs but instead be transferred to other departments. The installations are set to begin this January, and the entire project is expected to be completed by the end of next year, reports DNAinfo, so Cuomo can check that off his very Robert Moses–like to-do list.